Sunday's Gent-Wevelgem personified what a Classic should be like - Hard action! Race report and video from Wevelgem and the Volta a Catalunya, E3 BinckBank Classic and the USA Crits. Will Alejandro Valverde retire, or just keep going - Top Story. Other cycling news: Giro di Sicilia riders, Giro del Belvedere teams, Victor Campenaerts diary part 5 and Simon Geschke injury. Monday EUROTRASH coffee time! Alejandro Valverde has said the he will hang up his race wheels in 2021. The current World road champion told the Spanish newspaper El Periodico that "in principle I will retire in 2021. At a certain moment it must be that way." "I will ride another season after the Tokyo Olympics." 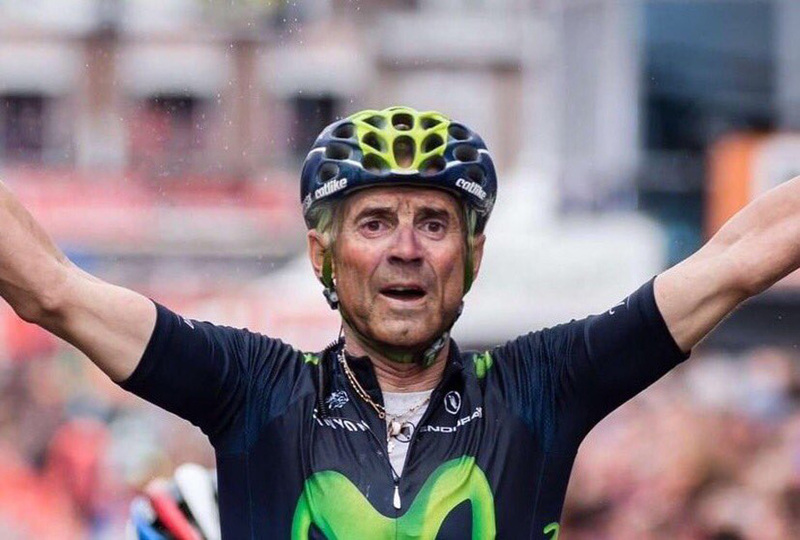 In 2021 (then 41 years-old) the Movistar leader will have raced for 19 seasons in the pro peloton. "I think that is a good time. When I return home, I have to enjoy the family. Then I will see what I will do"
Valverde hints at a position with his current Movistar team, under the wings of manager Eusebio Unzué. He would also like to get started to help the young cyclists in Murcia. Valverde adds that he is not finished yet: "The only difference is that this year I am gaining more second places, instead of victories. But if I wasn't in shape, I couldn't compete for the win," he says. "Racing at the highest level from your 23rd to your 39th year is very difficult." Alexander Kristoff (UAE Team Emirates) won one of the hardest fought editions of Gent-Wevelgem on Sunday. The Norwegian was the fastest sprinter from a shrunk peloton, beating John Degenkolb (Trek-Segafredo) and Oliver Naesen (AG2R-La Mondiale) Mathieu van der Poel (Corendon-Circus) livened up his WorldTour debut with a 4th place. It was a super-fast start, which kept everything together for a long time. After one hour, the riders had completed 51 kilometers. Once the peloton hit the coast; Jumbo-Visma made their move which surprised Deceuninck - Quick-Step. The Dutch WorldTour team put five riders in a break along with riders from Trek-Segafredo and Bora-Hansgrohe. Twenty riders escaped, including: Wout Van Aert, Peter Sagan, Maarten Wynants, Mike Teunissen, Taco van der Hoorn, Danny van Poppel, Pascal Ackermann, Rüdiger Selig, Mathieu Van der Poel, Matteo Trentin, Fernando Gaviria, Luke Rowe, Niki Terpstra, Cees Bol, Jan-Willem van Schip, John Degenkolb, Mads Pedersen and Jasper Stuyven. Tim Declercq was there as Deceuninck - Quick-Step policeman. Jumbo-Visma lost Van Poppel with a puncture and Van der Hoorn was dropped. After 100 kilometers the lead was at 1 minute. In the peloton it was Lotto Soudal who led, which kept the difference fluctuating around the minute. At the first passage of the Kemmelberg; Van Aert, Trentin and Van der Poel accelerated and split the group. The chase group was getting closer, led by Gilbert, Van Avermaet and Benoot, the lead came down to 20 seconds. Sagan, Trentin, Pedersen and Teunissen pushed on to hit the plugstreets first. 45 kilometers out and Rowe joined the leaders for the last passage of the Kemmelberg. Behind them Stybar and Van Aert managed to get away, but everything came together again. The chase group had the Deceuninck - Quick-Step engine to power it and the lead melted like snow in the sun, and they were caught 20 kilometers from the finish. Terpstra, Gilbert and Pedersen tried their luck, but nobody managed to stay away. Eventually Jasper Stuyven (Trek-Segafredo), Jack Bauer (Mitchelton-Scott), Armund Grøndahl Jansen (Jumbo-Visma), and Sebastian Langeveld managed to make a last hope break and held off till the last kilometer. Stybar and Gilbert hunted them down for their sprinter, Elia Viviani who was still in the main group. Viviani didn't have the legs for the head-wind finish and it was hard man Alexander Kristoff who hit the front and stayed there to the line. See the full PEZ Gent-Wevelgem Race Report with lots of photos HERE. 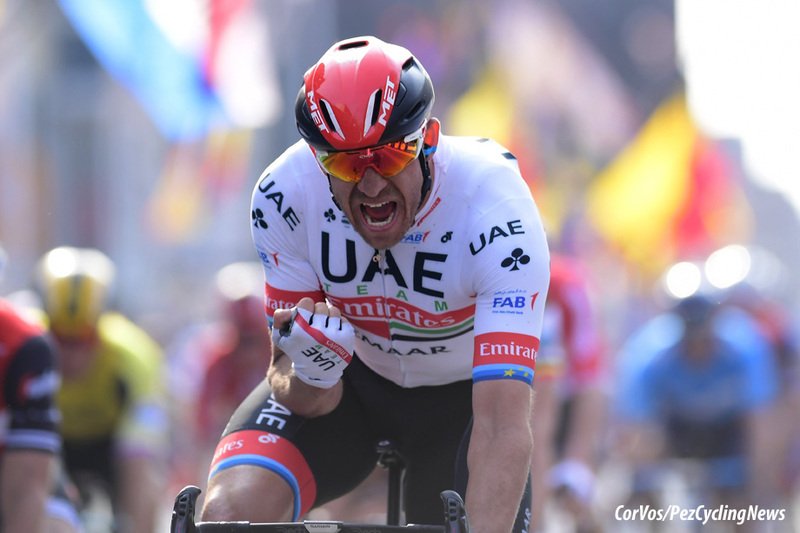 2019 Gent-Wevelgem winner, Alexander Kristoff (UAE Team Emirates): "I remained at the front of the group with Gaviria, at 10 kilometers out, we spoke and agreed that I would make this sprint and try to win. In the sprint, I was the strongest and that’s even if I was a little bit tired but all the riders at the front of the group raced hard and fast from the start. I pulled out a big win that carries a lot of weight in the spring classics. The team has improved a lot and I’m benefiting from the work that I’ve done with my trainers and with training rides a little shorter but more intense, and the results are starting to show. The change is paying off. I’m also content because I feel my condition is improving and it’s a good signal ahead of the Tour of Flanders." 2nd, John Degenkolb (Trek-Segafredo): "I am really proud of how we rode as a team. We were in the first group with four riders. This feels so good, especially after the disappointments of the past weeks. My focus was on the Viviani wheel. I then managed to choose the right side, which gave me a free hand. The timing was perfect, but there was just someone faster. Kristoff really did a great sprint. He therefore deserves this victory. This gives so much confidence with regard to Flanders." 3rd, Oliver Naesen (AG2R-La Mondiale): "It was a real race. That's why we ride a bike. That's the classics. Today it was full gas from start to finish, and that type of race suits me well. As I get older, I am stronger when the race is long. I sprinted using my experience. There was headwind, and I moved out from the wheels at the last moment. This is the third Sunday in a row that I'm on the podium (note: 2nd in the eighth stage of Paris-Nice, 2nd Milan-San Remo, 3rd Gent-Wevelgem). It's a good sign for next week with A Travers Flanders on Wednesday, and then Tour of Flanders on Sunday." 4th, Mathieu van der Poel (Corendon-Circus): "I get stuck twice in the sprint. That is my own fault. I am satisfied with my race, I have not experienced this often. My wattages really jumped into the air. There could have been more results, however, there was no space. Eventually I got stuck twice in the sprint, so I have to hold back. That's how I lost my speed. It makes sense that Wout van Aert is a bigger favorite for De Ronde [van Vlaanderen]. I had to watch out for Kemmelberg when he and Stybar accelerated. I can keep thinking about that sprint." 18th, Luke Rowe (Sky): "It's nice to bounce back. Through Paris-Nice and San Remo it's all gone pretty well and I felt good. For some reason or another E3 was just a massive fail for me and I was quite disappointed actually. I was quite keen to put things right this morning. Again we finished the race without a result, but just to be at the front and have good legs and sensations is the important thing before the coming weeks, I think I can be happy about today. I wasn't surprised at all to see the early move go. I'd seen it coming all day long. It was windy right from the start and splitting up from 500 meters into the race. It was just a matter of time before a group went. Every DS in the team car was saying 'crosswinds, crosswinds'. When you have a group of 20 or so riders, and teams like Bora, Jumbo and Trek have numbers, they are always going to keep the momentum up. I'm not surprised how far it went either. I lost a year of my life there! Those four had gone clear and I'd kind of missed the boat which was disappointing. After the gravel roads I just sensed everyone was on their knees. I still had a little bit of gas left so I thought I'd hit out on a little climb and hopefully bring one or two with me. Then you look around and you're on your own! You're committed then and you're in no man's land, so it was either get across or blow up trying. So I just went full gas and managed it. When you close a gap sometimes you can do the first half quite easily and then the second half took five or six kilometers. Luckily I just made it so I had a few kilometers before the Kemmelberg. We actually didn't go that hard up the Kemmelberg. I said to the guys just before it, if we split up we have no chance with the headwind to the finish. So we took it at a speed so all five of us got over it together. Then it was 30km into our headwind. That was our only chance. They got organized behind unfortunately. Now I think there can be a bit of excitement going into Flanders." Wout van Aert (Jumbo-Visma): "It was a very nervous game. That was really a very good situation, unfortunately Van der Hoorn dropped out at the front, just like Van Poppel due to a flat tire. I had known for a long time that the team was strong, but today everyone was prepared to go for it completely. But after that we had someone in the front with Mike. The latter was ideal. We are therefore ready for next week. I will not participate in Dwars door Vlaanderen on Wednesday. I'm going to do some good training now." Peter Sagan (Bora-Hansgrohe): "It was a beautiful and exciting Gent-Wevelgem but a very hard one! We were going over 50kph in the first two hours and when the strong winds created splits, I decided to take the opportunity and jump in the big break, together with Pascal and Rudi. They did a great job, worked hard and when we were left just four of us in the group, I gave my best to help stay ahead of the peloton. It wasn't possible and in the finale I didn't have the legs to go for the bunch sprint." 10. Jens Debusschere (Bel) Katusha-Alpecin. 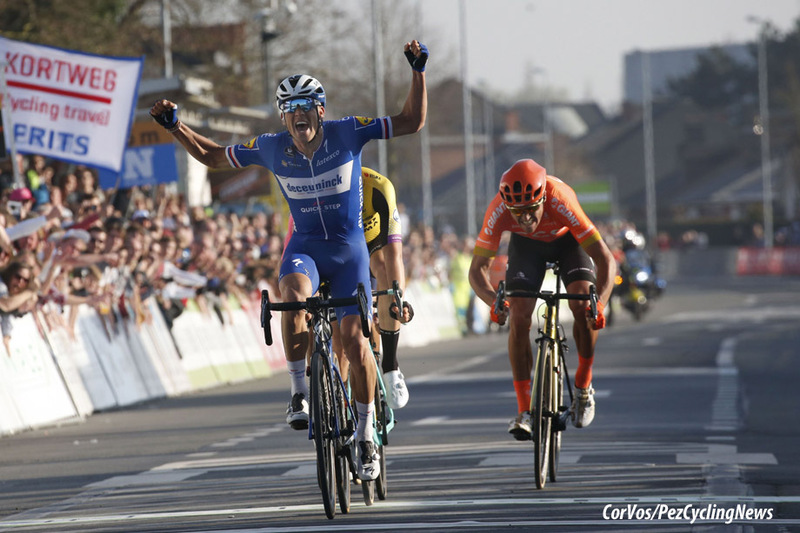 Zdenek Stybar continued Deceuninck – Quick-Step’s incredible spring campaign, netting the team’s 20th victory of the season from a five-man group following a highly-entertaining edition of the E3 BinckBank Classic in Harelbeke. At 203.4 kilometers, this year’s race packed in 15 climbs, including Taaienberg, Paterberg and Oude Kwaremont, hills that will also feature next week in the the Ronde van Vlaanderen. The break of the day took its time, but eventually seven riders got free: Jaime Castrillo (Movistar), Marc Hirschi (Sunweb), Aksel Nõmmela (Wallonie Bruxelles), Thomas Sprengers (Sport Vlaanderen-Baloise), Stijn Steels (Roompot-Charles), Mihkel Räim (Israel Cycling Academy) and Ludwig De Winter (Wanty-Gobert). Lionel Taminiaux (Wallonie Bruxelles) crossed to the group. After Kasper Asgreen and Iljo Keisse had done a superb job controlling the day’s main breakaway and inching the peloton closer to the eight men, before various Deceuninck – Quick-Step riders began testing the waters by launching spirited attacks. With 60 kilometers to go, Bob Jungels took off on the Boigneberg and went solo in pursuit of a group of escapees, joining them before making an important selection on the grueling Paterberg. With 30 kilometers remaining, on the Karnemelkbeekstraat, Jungels rode clear of his companions, maintaining a one-minute lead over a strong chasing group that had formed over the top of the Paterberg, including: Stybar, Wout van Aert (Jumbo-Visma), Greg Van Avermaet (CCC) and Alberto Bettiol (EF Education First). Held the others off until 7 kilometers to go, when he was reeled in by the four-man group. It wasn't the end for Jungels as he attacked again, making the others work hard in order to reel him in again, for Stybar to attack 4 kilometers out. The five were together under the flamme rouge, led by the Luxembourg Champion. Stybar kicked out with 200 meters to go to hold his opponents off for a memorable victory – Deceuninck – Quick-Step’s seventh at E3 Harelbeke, an all-time record. Stybar is only the fifth rider in history to win Omloop Het Nieuwsblad and E3 Harelbeke in the same season. Race winner, Zdenek Stybar (Deceuninck - Quick-Step): "I’m incredibly happy! Winning Harelbeke after Omloop is amazing, but I couldn’t have done it without this extraordinary team. We have such a great squad, all our riders can win a race and that’s one of the things that make the difference in our favor. Bob was instrumental in my victory, I couldn’t have done it without him, so I want to thank him for his enormous help. I told Bob to just go if he felt good and you could see him put down the hammer, applying quite a bit of pressure on the peloton and allowing us to save some energy. Having him at the front was an ideal situation for me as I just had to cover the attacks on the important climbs. When Bob got caught, I asked him how he was feeling and told him that he should try again if he still had anything left in the tank, so he took off the front again and made the others chase. Then I accelerated and rode flat out, hoping to hurt the other riders, especially as I still had plenty of energy left in the legs for a sprint. It ended up perfectly for us and this makes up very happy. We’re riding on a wave, know what we have to do and we will keep enjoying the coming races." 2nd, Wout Van Aert (Jumbo-Visma): "The E3 is one of the most difficult races of the spring. I certainly felt it in my legs. This race is just a bit more difficult than the previous classics. I am happy that I was able to ride a final again. I certainly thought about winning. But after such a difficult race it is always an atypical sprint. I felt really good and in the final kilometers I mainly focused on Stybar’s attacks that you knew were coming. It was the best tactic to be in his wheel straight away. Though it was far from easy. It also took quite a long time before we could bridge over to Jungels. That cost us a lot of energy." 3rd, Greg Van Avermaet (CCC): "I did everything I could to position myself for the finale and although, of course, I wanted to win, it is also good to be only the podium again. I know that the Tour of Flanders is the race that suits me the most so, I can take confidence knowing that I am good at the moment and hopefully, the best is yet to come. Michi Schär did a great job pulling and setting a really fast pace to stretch the peloton out, and Nathan and Kamil were also there to position me well. I was feeling good all day and once Michi pulled off, I knew it was a good moment to try and split the bunch. There were too many guys still there and if we wanted to bring Jungels back, we needed a smaller group. Once that front selection was made, we were only turning with three riders and the group behind was coming back, so I knew I had to make another move. There were guys just sitting on so when I attacked and we were just four chasing Jungels, it was perfect. It was always going to be hard to beat Stybar. He was the freshest and had the legs in the sprint. Already when he attacked in the finale, it was hard to bring him back. I don’t think I can have any regrets after my performance today." 8th, Oliver Naesen (AG2R-La Mondiale): "I had good legs but I was surprised by a counter attack. That’s life, but I'm a little disappointed with the final result. I was hoping to do a little better than eighth place, but sometimes that’s bike racing. I did not have an off day. Just to be able to finish in the top ten of a race like this, I cannot say that I had a bad day. It’s just that it’s the small details that make the biggest differences. Now it’s time to focus on Gent-Wevelgem on Sunday." 17th, Peter Sagan (Bora-Hansgrohe): "The first part of the race unfolded the way we had expected and planned. There was a small breakaway that didn't pose any threat and we knew I had to be in the front, ready for the attacks. The entire team did an excellent job controlling the race. However, I could feel that my form still hadn't reached its full potential and that I hadn't fully recovered. Then, after the final feed-zone, I felt that something had hit my rear derailleur. I'm not sure what it was but it wasn't working correctly. I rode for about 10km with that issue and by the time the mechanic fixed it, it was too late to close the gap to the front group." 10. Marc Hirschi (Swi) Sunweb. Miguel Ángel López (Astana) took the overall lead in the Volta a Catalunya by winning Stage 4. The Colombian took advantage of the battle between Egan Bernal (Sky), Nairo Quintana (Movistar) and Adam Yates (Mitchelton-Scott), to solo to the stage victory and the leadership. Adam Yates is second overall at 14 seconds, with Bernal at 17, Quintana at 25 and Dan Martin (UAE Team Emirates) at 46 seconds. Overall leader, Thomas De Gendt (Lotto Soudal) took the full KOM points at the top of the first climb, the Coll de Coubet. This energized the peloton and a group of 24 riders formed off the front. The peloton let them go to a maximum 3 minutes lead. This put James Knox (Deceuninck - Quick-Step) in the virtual lead as he was at 1:35 from leader De Gendt. Marc Soler (Movistar) and Gregor Mühlberger (Bora-Hangrohe) attacked leaving the others behind. While the other escapees were caught before the foot of the final climb, Soler and Mühlberger started the climb to La Molina with a 2 minute lead. The peloton had thinned out considerably, as Team Sky increased put the pressure on and overall leader, De Gendt, was amongst the dropped along with Thibaut Pinot and llnur Zakarin. Miguel Ángel Lopez attacked 8 kilometers from the top, but Egan Bernal gave chase with Nairo Quintana and Adam Yates on his wheel. The Colombians mainly looked at each other and López rode away. Steven Kruijswijk and Simon Yates managed to rejoin, this was good for Adam Yates, as his brother, Simon, immediately went to the front. López, who was 6th at 35 seconds, looked to be on his way to the leader's jersey as he caught Soler and Mühlberger. Adam Yates tried to catch the leading trio with Bernal following as Quintana and Kruijswijk lost ground. 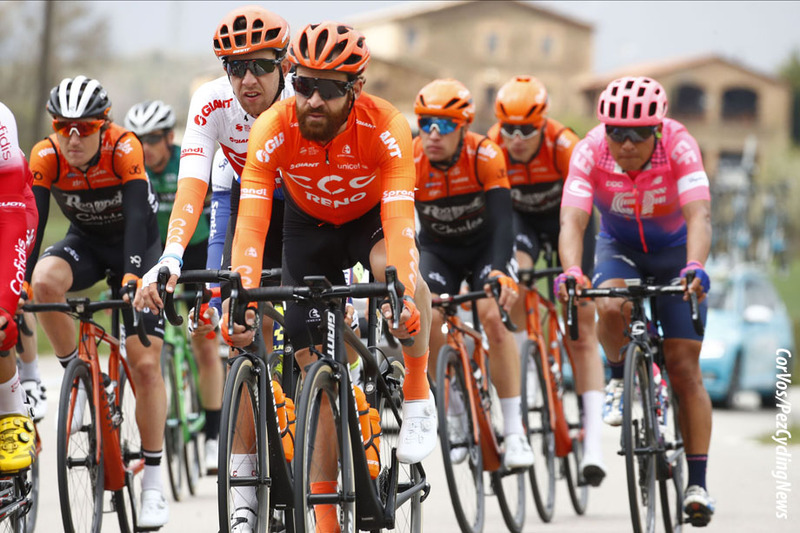 Yates and Bernal could not make contact with López and co.
López jumped Mühlberger and Soler just before the summit for the stage victory and the overall lead. Soler and Mühlberger held off Bernal and Yates, Quintana and Kruijswijk crossed the line 3 seconds later. Stage winner and overall leader, Miguel Angel Lopez (Astana): "I knew this stage could be a good moment to do something in the general classification. So, with the whole team we were motivated to do it well. The team did a great job for me during the whole day, protecting me well and providing me a very good position on the last climb. Yesterday I saw I have the legs to stay with the strongest riders of this race, so today I decided to try to attack on the final climb. Maybe, it was a risk, but for the first time I did an attack with around 8.5 km to go. And later, I attacked again inside the final 7 km, giving my best in this attack. I just went away, keeping the highest pace I could and this brought me the stage win. I am really happy with this victory, especially after being close to it last few times. Now I am the leader of the overall, but, for sure, the race is still open. We still have three stages to go and the battle for the GC is still ahead. I am happy with my win, so now I will move day by day in this race." 2nd on the stage, Gregor Mühlberger (Bora-Hansgrohe): "I am really happy with my result. I didn’t have the best legs to be honest but wanted to give it a try today. Max and I went into the breakaway, then I attacked to lead with Soler. It was not easy at all, and when Lopez bridge across, I knew I am not going to win because he was a lot fresher. But I gave it my all and was still able to secure second today. I think that was the maximum in the end." 5th on the stage and 2nd overall, Adam Yates (Mitchelton-Scott): "It was another good day. There was a big break today and we had both Impey and Tsgabu in there just in case anything kicked off early so they could be help out in the deep final. In the end once Sky started riding a hard tempo it all came back together quite quickly. The rest of the guys rode super to keep me out of the wind and then set me up perfectly for the final circuits. In the final, I was feeling pretty good but a bit like yesterday there was some games being played and Lopez managed to jump off the front and steal some seconds. It was good to have Simon there to ride in the final as well, otherwise the gap might have blown out because none of us were cooperating that well. As we said from the beginning this race is not over until Barcelona so we’ll have to wait and see what happens in the next few days." 4th on the stage and 3rd overall, Egan Bernal (Sky): "We tried to do a really hard stage with the guys. The whole team did a really good job. In the final we started to pull hard on the first part of the climb, because we knew that was the most steep. I attacked, but I think that the responsibility was with the best-placed rider (Yates) to control. It was a little bit crazy because there were a lot of attacks. I tried to control a little bit but in the final you need to be calm. When Lopez attacked, Yates was strong but he didn't close the gap. I just followed him because it was his responsibility in the final." 10th on the stage and 9th overall, Rafal Majka (Bora-Hansgrohe): "I have still not fully recovered from my crash at Tirreno-Adriatico, but I feel that my form is coming back. Day by day it is getting better, therefore I am satisfied with my current tenth place in the GC and especially that I was able to climb with all the other strong climbers today." 10. Rafal Majka (Pol) Bora-Hansgrohe at 0:42. 10. Marc Soler (Spa) Movistar at 2:36. Maximilian Schachmann (Bora-Hansgrohe) won Stage 5 of the Volta Ciclista a Catalunya on Friday. In Sant Cugat del Vallès he crossed the finish line solo after being in the early break. Michael Matthews (Sunweb) then won the sprint from the peloton. Miguel Ángel López (Astana) finished 10th to hold the leader jersey. Stage 5 was the longest stage of the Catalan race at 188.1 kilometers. Several riders tried to get away from the start, including Thomas De Gendt (Lotto Soudal), the winner of the opening stage to Calella. In the end, four riders managed to escape: Bert-Jan Lindeman (Jumbo-Visma) was the first to reach the top of the Collada de Toses, he was joined by Andrey Amador (Movistar), Tejay van Garderen (EF Education First) and Maximilian Schachmann. The four refugees took a four-minute lead. Arkéa-Samsic started to chase for their leader André Greipel and other teams got involved in the pursuit of the four front riders. With 20 kilometers to go, the time difference was only 1:30. At 11 kilometers from the finish, Schachmann made his move and the others in the break couldn't follow and were eventually caught. Schachmann had less than a minute on the chasers, but a crash slowed the peloton. Schachmann managed to keep the chase at bay and crossed the line in Sant Cugat del Vallès with a 13 second lead on the peloton. 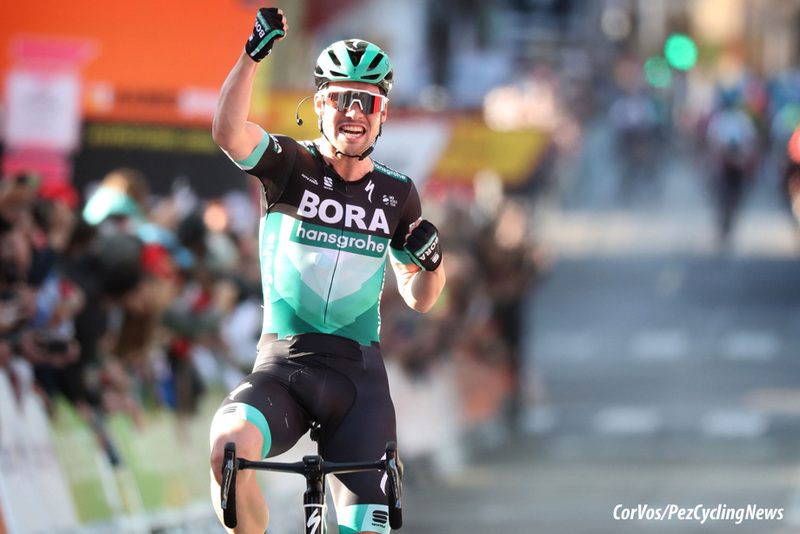 Stage winner, Maximilian Schachmann (Bora-Hansgrohe): "I knew, I am in a really good shape, therefore I wanted to achieve another stage victory at the Volta a Catalunya. After a second and fourth place, I knew I had to try it again, because there are not so many stages left. As the group attacked I joined them and with 20k to go, I thought, that we’ll have a good chance to make it to the finish. On the descent I attacked and just pulled to give it everything. I am so happy with the outcome and that I collected the points to now lead the points classification." 10th on the stage and overall leader, Miguel Angel Lopez (Astana): "It was a very fast stage, but for us everything went pretty well. The team did a great job always keeping me up there in front, we tried to be attentive in every moment of the race and in the end of the day I was able to finish inside the Top-10, holding the leading jersey for one more day." 2nd on the stage, Michael Matthews (Sunweb): "We were unsure as to how the day was going to pan out with the 20km uphill start and we originally planned to get Wilco into the breakaway if it was a large group. With it only being four ahead we started to ride early but the riders up front were really strong. The guys did a good job to close it down and position me well in the finale but it wasn’t enough and in the end we had to settle for second." 4th on the stage, Daryl Impey (Mitchelton-Scott): "It was a tough day in general but we kept calm and our main ambitions in tact and I feel like I have bounced back well from the crash yesterday. Our main goal today was to look after Adam and then if the sprint for the win was there it was a bonus. At the end Schachmann put in a super ride and the best legs won. We committed at the end because we saw there may be an opportunity for the stage but it wasn't to be but the team showed great commitment. Would have been nice to podium but my countryman got me on the throw for third place." A crash on the fifth stage of Volta Ciclista a Catalunya whilst chasing the break saw Team Sunweb's Wilco Kelderman abandon the race. Team Sunweb physician Anko Boelens detailed his injuries: "An x-ray has revealed Wilco has broken his left collarbone and suffered a neck vertebrae fracture in the fall. Our first impression is that the fracture is stable. He will most likely need surgery for the collarbone when returning back to the Netherlands. Once we've completed more checks, we will be able to give an update on the estimated recovery time in the coming days"
10. Miguel Angel Lopez (Col) Astana. Michael Matthews (Sunweb) sprinted to his second victory in the Volta Ciclista a Catalunya on Stage 6. The Australian jumped early in sprint and had just enough time to beat Phil Bauhaus (Bahrain-Merida) to the finish. Miguel Ángel López (Astana), who briefly attacked in the final, held the leader's jersey. The break of the day probably had no chance as the stage was not so tough that the sprinters would be dropped. This didn't stop them trying. Josef Cerny (CCC), Mikel Iturria (Euskadi-Murias) and Geoffry Bouchard (AG2R-La Mondiale) made the escape and was joined by Floris De Tier (Jumbo-Visma) and Oscar Riesebeek (Roompot-Charles). The five leaders got a maximum of 3 minutes ahead, but had a hard fight to keep it. They managed survived the mountains and headed towards the finish in Vila-Seca. The peloton was too interested in catching them, and with 12 kilometers to go, the day was over for the five and the remaining sprinters were ready for a stage win. Astana brought leader, López, to the last 3 kilometers, then Davide Formolo made a dive for a solo stage victory. It was only Lopez who responded to Formolo, but the race came together again in the last kilometer. Matthews started his sprint early in the final kilometer and saw Bauhaus come up to him, and so made a second acceleration to outwit the German. Daryl Impey (Mitchelton-Scott) was a close third. 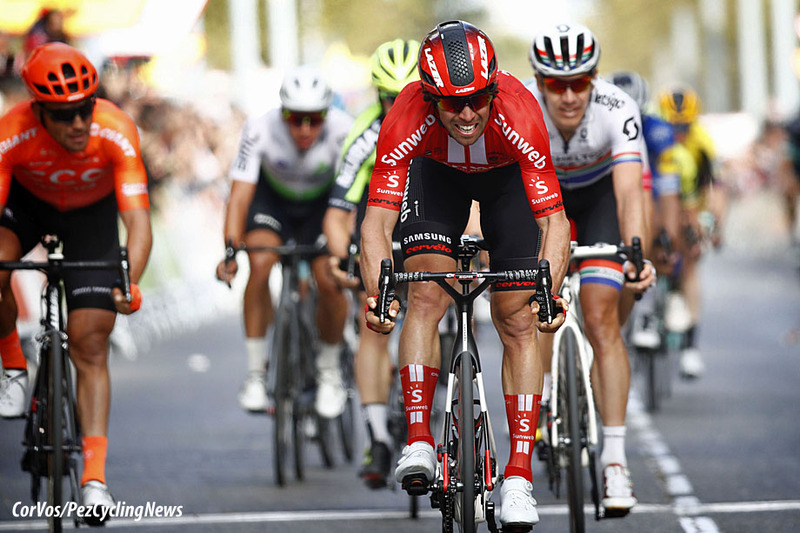 Stage winner, Michael Matthews (Sunweb): "I was really tired after the difficult few stages we’ve had so I wasn’t sure if I would be up for the sprint today. However, around halfway through the stage I felt much better and the team started to work at the front. The sprint was very technical but the guys positioned me at the head of the bunch coming under the flamme rouge. I followed the right wheels and just had enough to hold on for the win. The team were very motivated to get a result for Wilco today after his crash in yesterday’s stage and I’m really happy we pulled it off." 2nd on the stage, Phil Bauhaus (Bahrain-Merida): "In the end it was all about legs and he was few cms stronger than me or he did a better stroke of the bike. In the final Caruso helped me and I was really well positioned. With 300m to go I found myself on the wheel of Matthews and I think today I started the sprint in the right moment. For sure you can be disappointed if you lose so close. I’m sure in the future we can make one place better. We controlled the race from the beginning until the end, almost without any support, just Dimension Data helped us. We were the strongest team today. Everybody in the team gave 100%. I’m really proud of the team. I think everybody did what they have to do. Today was again excellent team work." 3rd on the stage, Daryl Impey (Mitchelton-Scott): "Today was probably the easiest stage in terms of terrain but it was pretty stressful and we were basically on the pedals all day trying to hold our position. Personally I would have liked to walk away with a stage win but I am glad I have been around the mark all week, it was a shame we lost Dion to a puncture in the final as we have been working really well this week and having him there in the final today might have changed things for me. We came here aiming to podium and win a stage, we have already won our stage, now we will just put all our effort into Adam and hopefully win the overall or worst case protect our podium place." 8th on the stage and overall leader, Miguel Angel Lopez (Astana): "Another very fast day, but my team was very strong today. The guys did a great job for me, I was always in front, especially in the tricky final, when the pace increased so much and the peloton split in parts. Indeed, the last kilometers were so dangerous, so when I saw Formolo attacking, I thought it could be a good move and just followed him. In this dangerous final it was better to be I front than behind. Yeah, in general everything was good today and now we are looking forward to the tomorrow stage in Barcelona. I know, that it will be a big fight for the general classification, so let’s see." 9th on the stage and overall, Rafal Majka (Bora-Hansgrohe): "The plan was to go for Jay, but he hadn’t the best legs today, therefore we went for Davide in the final kilometers. He was so strong in the last kilometers; his attack was really impressive. Unfortunately, the peloton was fast and caught him at the Flamme rouge. I was in a good position after the last roundabouts, so I took my chance and came in ninth. With this result I also secured my spot in the GC as well." Davide Formolo (Bora-Hansgrohe) won the Final Stage 7 after a fierce battle with eight climbs of the Montjuïc. Miguel Ángel López (Astana) assured his final overall victory by finishing with all his closest rivals. Eleven riders escaped early on the stage to Barcelona: Thomas De Gendt was there for the KOM points, he was with Nick van der Lijke, James Knox, Patrick Bevin, Carlos Verona, Davide Formolo, Alexis Gougeard, Danilo Wyss, Jesús Herrada, Alexandr Riabushenko and Fernando Barceló. Astana started to chase for their leader, Miguel Ángel López, as Quintana and Woods were 4th and 7th overall. The Kazakh team brought them back with two laps to go, but there wasn't many left in the peloton. Up front; Formolo had ridden the others off his wheel for a top class stage win. The Yates brothers went on the attack and managed to build a lead on the peloton and the leader López. Adam - second overall - rode away from his brother Simon, looking for the overall win. It didn't work as Yates was caught a few kilometers from the finish by the group of favorites. Bernal, Quintana, Alejandro Valverde and Steven Kruijswijk attacked López, but the Colombian had no problem controlling the situation. Enric Mas (Deceuninck - Quick-Step) and Maximilian Schachmann (Bora-Hansgrohe) escaped on the final climb to finish just ahead of the other chasers. Final overall winner, Miguel Angel Lopez (Astana): "I am super happy with this victory! It is something great! Together with the team we considered this race as one of the main points in the beginning of the season and today we could complete our goal. It was a nice race and I had a great support of my team. I felt good during the whole week here in Catalunya, and, in the same time, I was improving day by day. After my win atop La Molina I believed that together we can do it until the end. I thank all the team for this week. It is our common, Astana Pro Team victory! We knew the rivals will try to do something on Montjuic, so we were ready. I had strong teammates next to me and they did absolutely incredible job! In every moment of the race, even Adam Yates went away we tried to keep calmness, gaining the terrain back second by second. In the end it worked out perfectly and I could save my jersey. It was a super hard day on the road, but I’ve got the final victory for my team and now I am happy!" 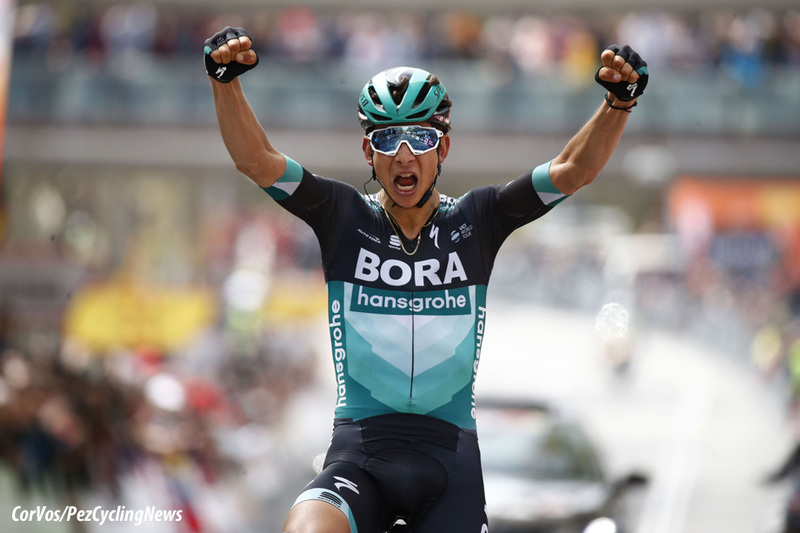 Stage winner, Davide Formolo (Bora-Hansgrohe): "I can’t describe how happy I am. The victory means a lot to me. I went into today’s stage with the goal to be in the breakaway and to try from there to win the stage. On the local laps I thought, now or never, so I just attacked. I pulled so hard, but I knew with 8 km to go that I could make it. The team was great this week, we achieved a lot at this Volta a Catalunya. Now it is time to go home, rest and look forward to the next races." 2nd overall and 7th on the stage, Adam Yates (Mitchelton-Scott): "We wanted to be aggressive in the final and today was the last opportunity to take some time. Everybody knows this circuit is not like rolling into Paris, it is not an easy day, it’s not an easy circuit and we tried to make it hard from the beginning. Even earlier on before the circuits we rode, just to make sure we were out of the wind and in good position and at the end there we were aggressive. We had Grmay Tsgabu riding to make it hard and then the guys attacking every lap or every other lap. I think it was three laps to go when Simon attacked again and that was the moment so I went across to him. It wasn’t planned or anything but we rode well there for a couple of laps and it not too easy to take time on this circuit. It was the last chance so why not have a good go and we tried, we gave it a go and all the guys rode really well today. On to the next one." 3rd overall and 6th on the stage, Egan Bernal (Sky): "I’m happy because this is my second podium in two WorldTour races. I’m really happy to keep the podium place. The level was really high. We tried, we did our best and now we focus on the next races." KOM, stage 1 winner and early overall leader, Thomas De Gendt (Lotto Soudal): "The plan was to be part of the breakaway today, not only to secure the KOM jersey, but also to go for the stage win. Eventually, the winner – Davide Formolo – was in the break, so it seemed like the right tactics. But unfortunately, I did not have the legs anymore to join Formolo. I knew that I had to take the points on the first three climbs of the day to be sure of the mountains classification. Right after, Formolo attacked, but I just couldn’t respond anymore. After a tough week in Catalunya and also a hard Paris-Nice, the tank was a little empty today. Of course, I am very satisfied with the Volta a Catalunya I rode. Especially the stage win was very nice and it gave me a great feeling to already add a win to my name. The polka dot jersey on top is a nice bonus. Of course, I wanted to hold on to the leader’s jersey as long as possible but a nice spot on GC was never within reach because I know really well what I am capable of on the climbs. I rode in a leader’s jersey during six out of the seven days, so I can say it was a successful week of racing. After a long training camp in Calpe, the Tour de Romandie will be my next race." 10. Marc Soler (Spa) Movistar at 3:02. 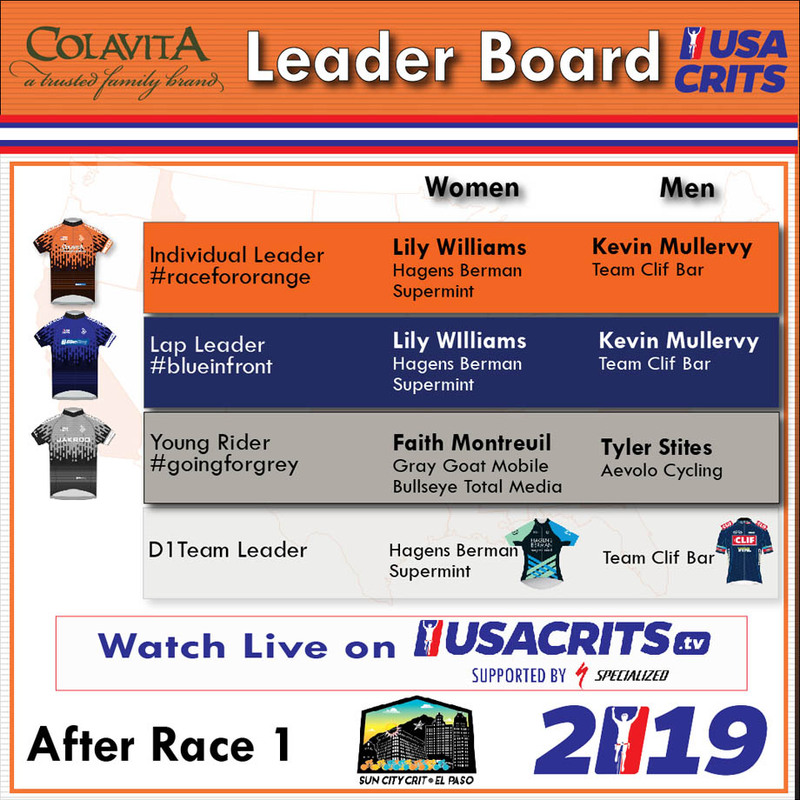 Kevin Mullervy of Team Clif Bar notched the first victory of the USA Crits season for the men, beating Tyler Stites (Aevolo Pro Cycling) by a bike throw on the line. The pair were part of a breakaway that formed in the first half hour of racing. The win vaulted Mullervy into Colavita Olive Oil Leader jersey and helped secure his team the overall team lead. Strong winds and cooling temperatures welcomed racers of all levels as they took the start for a full day of racing around San Jacinto Plaza. The winds increased as the sun set, playing a significant factor in both the pro men’s and women’s races - gusting close to 30mph at times. In the end, it played to the advantage of the breakaway, with none of the riders interested in fighting the swirling winds alone. Hagens Berman Supermint’s Lily Williams escaped from the women’s field shortly after the starting air horn blew, showing her strength to repeat another victory to open the season. Williams powered 25 laps of the 70-minute race solo, that earned her the BikeReg Lap Leader jersey. Her teammate, LeighAnn Ganzar and Emily Flynn (LA Sweat) would later bridge up to her before the Supermint duo broke away in the final laps to finish 1-2. Their teammate, Starla Teddergreen won the field sprint to finish 4th. The inaugural El Paso Sun City Crit on Saturday was the first stop of the series and the first professional bike race to take place in the Borderland. Sponsored by Destination El Paso, the sponsorship agreement is set through 2024, working with their sister city of Juarez, Mexico to expand the event in the coming years. “Right when Lily was in sight, the field lulled. There had been some hard attacks afterward and so everyone was tired, so I figured it was a perfect opportunity to jump around. It’s really motivating when you have a teammate that’s going to work with you. Once we got up there we were just working really smooth trying to keep it steady. We had a word in our ear letting us know, as long as it’s Hagen Berman on the top step, it doesn’t matter to us. Watch the entire Series live as the action unfolds on USACRITS.tv, a platform designed to achieve sustainability for the growth and funding of the sport. Membership and purchase of pay-per-view events will directly support additional live streaming, prize money, events, and most importantly, teams and athletes. Membership to USACRITS.tv is $55 annually. Fans will also be able to purchase these races as pay-per-view by event for $15. Each membership offers a return directly back to D1 teams and events, adding to the sustainability and growth of American criterium racing. Members can view over 20 days of racing in 2019 and have access to 50+ past events as video on demand. 18 teams at the start of 7 riders each. Many riders will chase success, plus opportunities for young guns to impress. The teams and provisional entry list of Il Giro di Sicilia Open Fiber are announced today. The four-stage race is organized by RCS Sport / La Gazzetta dello Sport in conjunction with the Sicilian Region and scheduled for 3 to 6 April. The challenge is open to join the Honor Roll as a champion alongside previous winners of the caliber of Giuseppe Saronni, winner of the last edition in 1977. All the main Italian Professional Continental and Continental teams will participate in Sicily, as well as UAE Team Emirates, the most "Italian" among the WorldTeams, along with a large group of teams featuring young and interesting riders as well as experienced veterans. In addition to the 7 Italian teams, there are also 11 foreign teams. An international roster heading to southern Italy. Team UAE Emirates will fly many flags when it races the Giro di Sicilia stage race from April 3 to 6. Among the seven riders in the roster, six nations are represented, including one from the sponsor’s home. 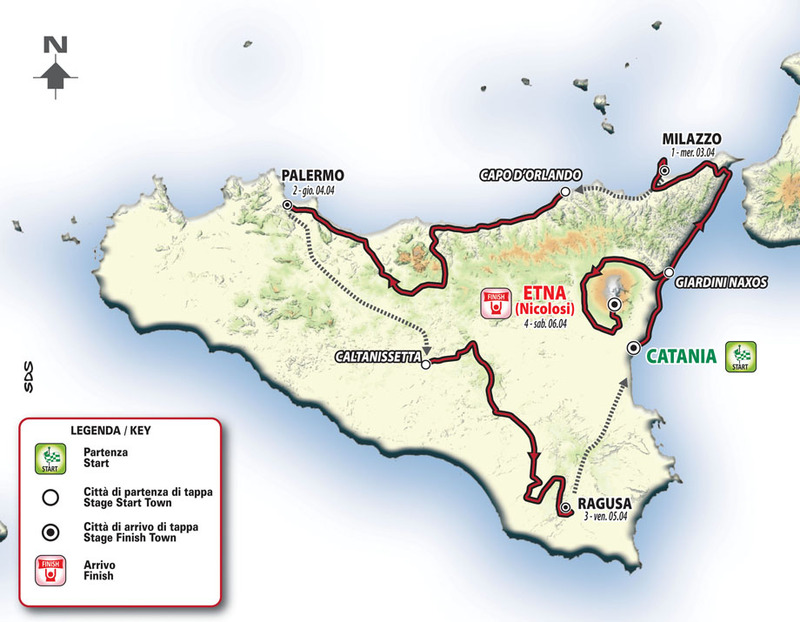 The race covers four stages on the famous island: Catania-Milazzo will suit sprinters, Capo d’Orlando-Palermo will favor an escape group, Caltanissetta-Ragusa and the final Giardini Naxos-Etna stages will be geared to attackers and climbers. Among the roster, Jan Polanc stands out since he won the Mount Etna stage in the 2017 Giro d’Italia. "It’s always beautiful for me to return to Sicily and above all, to Etna," he said. "I’d like to repeat that show that gave me the Giro stage win. I like that climb and my condition after Tirreno-Adriatico is still good. I’m not going to be under any sort of pressure, but I’ll ride with optimism and courage." Emirates rider Yousif Mirza added, "I maintained my race rhythm that I had at the UAE championships, so I’m going to be heading to Sicily with good form. The team is competitive, and I’ll try to give my best and I’m motivated to race in Italy." Of note, Sebastian Molano is returning after he recovered from a wrist fracture. He suffered it in a crash at the Omloop Het Nieuwsblad early in March. Thanks to RCS Sport and the Region of Sicily the big cycling is back the wonderful Italian region. 4 stages in which the 7 #OrangeBlue riders will try to leave the sign. 4 climbers, the Japanese Hideto Nakane, the Colombian riders Alejandro Osorio, the Italian Filippo Zaccanti and the Spanish rider Joan Bou. 3 riders for the mixed stages such as Moreno Moser, Damiano Cima and Sho Hatsuyama. The big cycling is back to Sicily, thanks to RCS Sport and the Sicily Region, from 3 to 6 of April with the Giro di Sicilia. The NIPPO Vini Fantini Faizanè will ride this important race with an international line-up composed by 7 riders coming from 4 different countries. 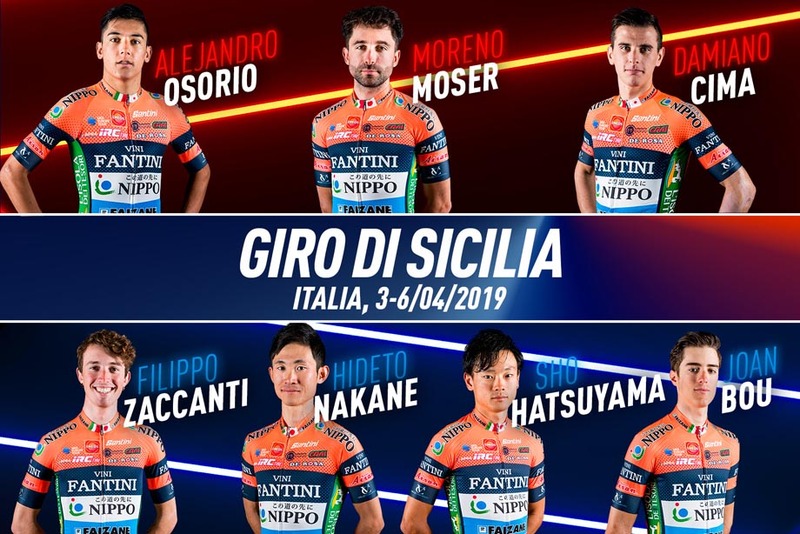 At the start of the Giro di Sicilia this Wednesday 7 #OrangeBlue riders ready to compete with high level teams, but looking for an important results. Hideto Nakane and Alejandro Osorio the top climbers with Zaccanti e Bou supporting them, Damiano Cima and Sho Hatsuyama the team workers, Moreno Moser for mixed stages. Moreno Moser, Hideto Nakane, Alejandro Osorio, Filippo Zaccanti, Damiano Cima, Sho Hatsuyama, Joan Bou. The Giro di Sicilia is composed by 4 stages, the first one with official start from Catania and the last one on Saturday 6th of April with the spectacular climb on mount Etna. The stages will involve wonderful locations of the Sicily such as Milazzo, Capo d’Orlando, Palermo, Catania, the Mount Etna and Giardini Naxos, showing to all the international public all the wonderful locations of this region. All the stages will be broadcasted on Rai2 in Italy and by many International broadcasters. 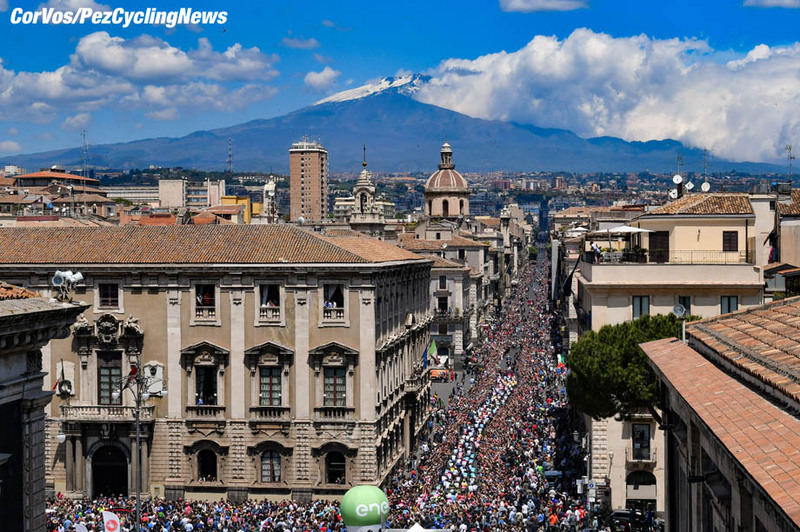 With an ambitious agreement between the Regional Government and the company organising the Giro d'Italia, the Giro di Sicilia is back after four decades of lethargy. The Kometa Cycling Team, invited by the promoters of this project to be one of the eighteen formations that will take part in the rebirth of the competition, will be present at four days of very high level cycling. The recovered Giro de Sicilia, a race that came to light two years before the Giro d'Italia itself (1907 vs. 1909) and that experienced many interruptions until its definitive blackout at the end of the seventies (1977, specifically), has insured at least three editions and goes hand in hand with the next presence of the pink corsa in the island territory for at least two years, including Grande Partenza 2021. A bet of eleven million euros with a promotional and tourist backdrop that will be inspired in its route by missing events such as the Giro dell'Etna, disputed between 1980 and 1994 with a brief return between 2001 and 2004, or the Trofeo Pantalica, on the road between 1975 and 2003. Isaac Cantón, José Antonio García, Juan Pedro López, Stefano Oldani, Antonio Puppio, Michel Ries and Diego Pablo Sevilla are the riders designated to face this demanding and mediatic sporting, personal and collective challenge. Oldani will arrive to the race two days after having taken part in the Settimana Coppi e Bartali summoned by the Italian national squad. "In two days we started the Giro de Sicilia, but I don't think it's going to be a special problem. If the condition is the same as we had in Croatia I think we can offer a very good image," said the Milanese. "It's going to be a good test for everyone", says Juan Pedro López. "I'm really looking forward to taking part in this race", tells Michel Ries. The Luxembourger adds: "It is sure to be a very difficult race. Personally I think I have done a good training in recent weeks, so I look forward to competing again in this special place and with a finish in Etna on the last day. I think we have a very strong team, a team that has done a good job in the last few weeks. We can compete again with a good dose of motivation". This new Giro de Sicilia emerges as a very difficult challenge due to its varied layout. The first stage, Wednesday's journey between Catania and Milazzo, presents an optimal route for the sprint despite the presence of Colle San Rizzo 55 km from the end. For Thursday, a marathon day of 236 kilometers between Capo d´Orlando and Palermo with a central area complicated by the ascent to the village Geraci Siculo and 50 kilometers later very sinuous. The third stage, between Caltanissetta and Ragusa, has a complicated end due to the chained ascent to Serra di Burgio and the arrival in the town centre of this UNESCO World Heritage Site. The end of the Saturday festival, the finishing touch of the race, comes from the hand of the well-known ascent to Mount Etna, up to the 1,892 meters of altitude where the Rifugio Giovanni Sapienza is located. An ascent that from the population of Nicolosi presents 20 kilometers to more than 7% on average, although the ascending tendency will come from much earlier in a stage of 122 kilometers. 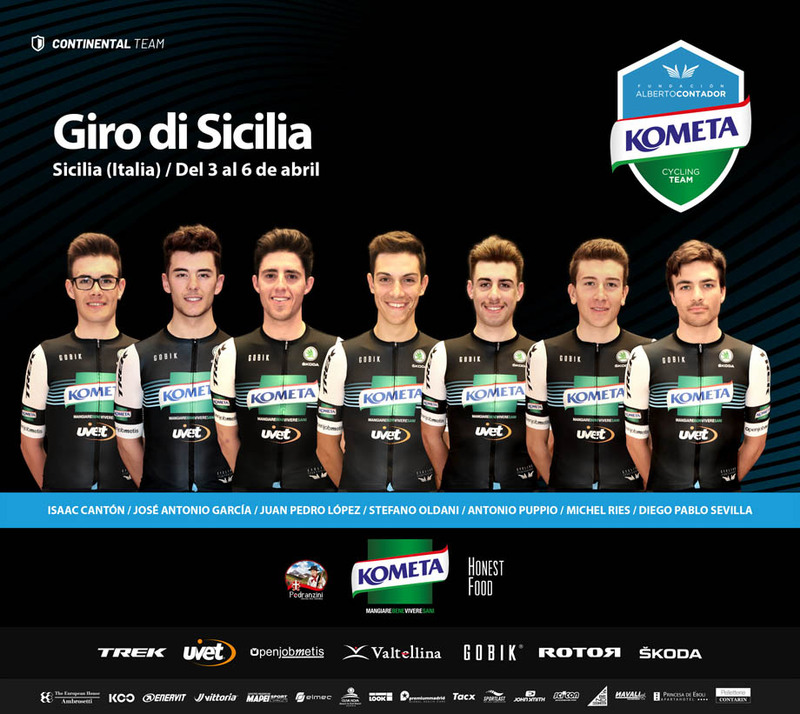 Dario Andriotto, sports director of the Kometa Cycling Team: "It's our first race of the season in Italy and it's going to be very special. This invitation is an honour, as the organisation is the same as the Giro d'Italia and that means that they take our project into account, and a responsibility, because many of our main sponsors, with Kometa, Uvet and Openjobmetis at the front, are Italian. We are a very young team and in front of us we are going to have structures with much more tradition and sporting power, but we went to Sicily with all the desire and all the illusion of the world. It's going to be a challenge, because the route won't be easy at all and there will be a lot of competition. The final in Etna is going to be very hard. But there is also a stage of more than 230 kilometres. And the roads of Sicily are always very winding, very nervous". The Italian classic confirms its international status: 21 Italian and 14 foreigner squads at the start in Villa di Cordignano (Treviso, Northern Italy) on April 22nd with a strong line-up from the East Europe. Giro del Belvedere rides at full speed towards its 81st edition, on Monday April 22nd in Villa di Cordignano (Treviso, Northern Italy). The U23 international classic is ready to welcome the world’s best cycling prospects. As in the 2018 edition, 35 teams have been announced by Pro Belvedere’s organizers, including 21 Italian squads and 14 foreigner outfits with a strong line-up of East Europe’s selections. Spotlights on the Russian Team and the national selections from Belarus and Slovakia - the latter home country of the triple World Champion Peter Sagan beside Astana Pro Team’s youth team, Astana Continental (Kazakhstan). Moreover, Brits Charles Page (Canyon DHB) and Mason Hollymann (Holdsworth-Zappi), and the Colombian climbers of Coldeportes Bicicletas Strongman Team should also be watched carefully. In the last three editions have been taken by all foreigner riders: Swiss Patrick Muller (2016), Belarussian Alexander Riabushenko (2017) and Aussie Robert Stannard (2018). All in all, teams from 12 different Countries will take part in the 2019 Giro del Belvedere: Italy, Belarus, Russia, Slovakia, Kazakhstan, Colombia, UK, Germany, Switzerland, Slovenia, Principality of Monaco and Netherlands. The riders will face a 163 Km route, characterized by two different circuits: the first (12 Km to be repeated 12 times) including the Conche hill, whilst the final circuit (17,3 Km to be repeated twice) includes the classic Montaner climb in Borgo Canalet and Via delle Longhe hill. Aran Cucine Vejus, Biesse Carrera, Bike Team Nordest, Casillo-Maserati, Cycling Team Friuli, Cycling Team Valcavasia, D'Amico Um Tools, Dimension Data for Qhubeka, Futura Team-Rosini, G.S. Maglificio Bibanese, General Store-Essegibi-F.lli Curia, Iseo Rime Carnovali, Northwave-Cofiloc, Sangemini Trevigiani, Team Beltrami TSA Hopplà Petroli Firenze, Team Colpack, Team Fortebraccio, Team Franco Ballerini U23, Velo Racing Palazzago, Work Service Videa Coppi Gazzera, Zalf Euromobil Désirée Fior. Belarus National Team, Russia National Team, Slovakia National Team, Astana City (Kazakhstan), Coldeportes Bicicletas Strongman (Colombia), Canyon DHB P/B Bloor Homes (Great Britain), Herrmann Radteam (Germany), Holdsworth-Zappi (Great Britain), IAM Excelsior (Switzerland), KK Kranj (Slovenia), Lokosphinx (Russia), UC Monaco (Principality of Monaco), VC Mendrisio (Switzerland), Wielerploeg Groot Amsterdan (Netherlands). Diary Victor Campenaerts Part 5 - Buenos Días Mexico! Part 5 – 18 days to go – Buenos Dias, Mexico! Eddy Merckx successfully attacked the Hour Record in Mexico City 47 years ago. But Aguascalientes is situated about 500 kilometers northwest of the capital. The eponymous state is one of the 31 in the country. Until now, a successful men’s Hour Record attempt did not take place there. In the women’s category, Vittoria Bussi broke the record last year. The Velodromo Bicentenario in Aguascalientes – every year the scene of a Track World Cup event - is situated at an altitude of 1,880 meters above sea level and is known as one of the fastest tracks in the world. As a homologated UCI track, one lap accounts for 250 meters. To exceed the distance of 54.526 set by Bradley Wiggins, Victor Campenaerts has to cover over 218 laps in 60 minutes. To attain that goal, Campenaerts needs to maintain an average lap speed of 16.4 seconds, or almost four laps per minute. Moreover, the extra time the European time trial champion needs to reach cruising speed, ten seconds spread over the first three laps, should be taken into account. 16.4 seconds x 218 laps + 10 seconds = 59’45” for 54.500 kilometres. That way, Victor has exactly fifteen seconds left to cover at least 26 meters. In an unfortunate case of bad luck, Simon Geschke, who returned to racing at Volta a Catalunya after fracturing his elbow at Vuelta Ciclista a la Región de Murcia, has sustained a broken collarbone as a result of a crash on the final stage in Barcelona which also included Łukasz Owsian, CCC Team doctor, Dr. Daniele Zaccaria confirmed. "Both CCC Team riders went down at high speed and while Łukasz escaped with only some abrasions, Simon was immediately taken to hospital for observation. X-Rays revealed that he has sustained a broken right collarbone and he will require surgery at home in Germany. We expect the procedure to take place next week and Simon should be able to resume training indoors five days after surgery with an expected return to racing after another five weeks," Dr. Zaccaria explained. CCC Team will continue to provide updates on Geschke’s recovery.